Carla Violet is one of our trendsetters at Mode Republic! Let’s learn more about her. My real name is Carla Florendo. Violet is just something I made up because I love the color purple. I'm from Macau but of Filipino ancestry. I'm currently a student, taking up Events Management. But my mom has a boutique that sells clothes and accessories, and I usually help her out in running the business. Ever since I was a little girl, I've always wanted to do something related to fashion. I always thought of being a model, then later I changed my mind and wanted to become a designer. Now I'm taking up events management because I'd like to work in events such as fashion shows in the future. Also, my mom is a fashion loving person. Growing up, I always had to dress up nicely according to her. I guess it I just grew with it. I have always loved dressing up and I have always thought of sharing this love with other people, although then I didn't really know how to; I wasn't aware that the fashion blogsphere existed. When I saw lookbook.nu, I was inspired by the people that I saw there. I thought of creating my own lookbook by blogging instead of joining the community. That's when when I found out that there actually was a bigger community that does that (outfit posting and stuff). I think that my biggest dream so far is to have my own fashion line. Then I'd have fashion shows in Paris and New York, and something like that. The idea of becoming a designer just stuck, so I guess that's my biggest aspiration. How would you describe your style? What’s your favorite look at this moment? My style is always changing. I find inspiration in many things everyday and they constantly influence how I dress up. Also, I'm a very moody person so I base what I'm wearing on my current mood. One day I can wear something so feminine, the next day it can be inspired by masculine pieces, something like that. As of the moment though, my favorite look is something like the photo below. Because of the heat, I like wearing oversized tops and short bottoms like denim shorts and mini skirts. Leopard is my favorite print too, so I like anything in leopard print. My fashion inspiration are fashion bloggers and people I see on the streets everyday. From bloggers, I am always inspired. From people on the streets, I get inspired whenever I see someone wearing something that I don't know how to pull off. It makes me think that if they can wear it, I can too. Where do you shop? What are your favorite brands? I usually shop at my mom's store, simply because it's free for me or I get a very big discount. Outside, I love shopping at Cotton On and H&M cause they have affordable but trendy pieces. I like Stradivarius, Zara, and Bershka too. But I have to say my favorite local stores are Black Moss and Friendly cause I find a lot of unique pieces there. Congratulations again to Carla Violet for becoming the Mode Republic trendsetter! Stay tuned for more fashion inspirations from Carla Violet! Hi everyone! We are Nancy and Therese - the team behind Mode Republic. We are passionate about street fashion and internet technologies. We believe the best stylists walk on the street around the world. Our goal is to connect these fashionistas with shoppers. 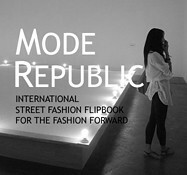 We created the Mode Republic Fashion Flipbook so Fashionistas can upload their photos to show the world their unique styles. Shoppers can get inspirations and instantly Shop The Look through our product matching engine.